Our government has been for a while now trying its best to figure out ways to get American workers to help themselves by saving for their retirement. Too many still think that Social Security is a retirement savings program in and of itself (it’s only designed to provide 20-30% of total retirement income). A couple of the better ideas that have found their way into practice recently are the automatic enrollment and automatic escalation features of a 401(k) plan. Companies that have automatic enrollment as part of their retirement plan sign up new employees upon starting employment usually at a low default rate of about 3% unless the employee specifically chooses to opt out of the plan. This accomplishes getting the individual saving at least something and beginning to build their nest egg. Automatic escalation takes that initial withholding rate of 3%, for example, and raises it automatically by 1% per year until the withholding rate reaches a predetermined level – usually about 10-12%. This feature is designed to make saving more painless by increasing your savings rate slowly and periodically as your take home pay is affected a little at a time. While these features are no doubt a benefit to those who may have never taken care of their own retirement saving it raises the possibility of an unintended consequence. Is automatic enrollment creating a group of apathetic investors? Let’s look at the evidence. If you’re someone who’s interested enough in saving to sign yourself up for your company’s 401(k), you’re probably also interested enough to check out your statements periodically and follow how your investments are doing. Someone who is only signed up for the company retirement plan because their employer signed them up probably has no real interest in saving or following how their funds are doing. And let’s face it. People who’ve been automatically enrolled at an initial savings rate of about 3% probably aren’t keeping the HR folks busy by constantly increasing their savings rates and asset allocations. They’re probably continuing that initial savings rate and remaining blissfully ignorant at what’s going on in their account. I read an article recently that sort of intimated the same. In addition to thinking that automatic enrollment created a “new group of unengaged investors”, the author also suggested that these folks also may also be mistakenly believing that the default savings rate their employers have signed them up for will be sufficient in providing a comfortable retirement – a notion that they’re almost certainly going to realize far too late and at a point where it may be too late to do something about it. 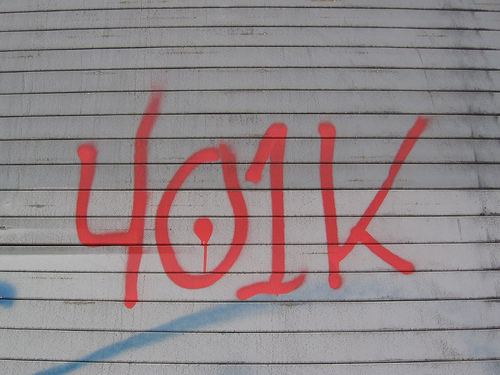 So are these new 401(k) plan features a good thing or a bad thing? I think that anything that gets more people to save, whether it’s forced or not, is a good thing. I do believe that employers who automatically enroll new employees should at least be following up with these folks – maybe an annual checkup would suffice – to try to encourage them to take a more active interest in their retirement savings and bump up their level of savings to something more sufficient to support them in retirement. Getting people started on the road to savings is a good first step but as with many ideas like this, it’s just a first step. I’m in my 20′s … and though I’m paying into SS, I don’t expect I’ll ever receive any SS benefits. Wouldn’t it be nice if I could just keep the SS tax that’s hijacked from my paycheck so I could use the funds to save and invest on my own? I don’t think that’s such a bad idea but then again I’d save my Social Security tax to try to get a better return. Most people wouldn’t and their one “guaranteed” source of retirement income would be gone. That’s why I think privatization will never fly.